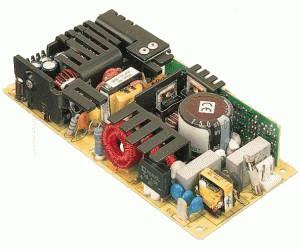 The NLP110 is a series of 110 W ac-dc open frame power supplies in a 3 x 6.5 x 1.26 inch package. The NLP110 is power factor corrected to meet EN61000-3-2 and is available in single and multiple output models. The multiple output models have a capability that is unique to the power supply market - they can deliver equal amounts of current on multiple low voltage outputs to support designs that will span the industry transition from 5 V logic to 3.3 V logic. The NLP110 is practically the same size as a 65 Watt 3 x 5 inch product, for example, NLP65 - the one difference is that the footprint is a mere 1.5 inches longer. The NLP110 is primarily designed for networking applications in 1U shelves or boxes that have a heavy logic content such as access concentrators, midrange routers, LAN switches and shared media hubs. The availability of single output models with high peak load capability also means that the NLP110 can provide a power factor corrected solution for applications currently using the NFS110. Size (L x W x H): 6.500" x 3.000" x 1.300"